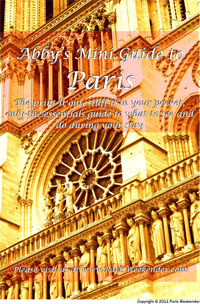 Paris Weekender - Updated Mini Guide to Paris and Restaurant & Bar Lists! 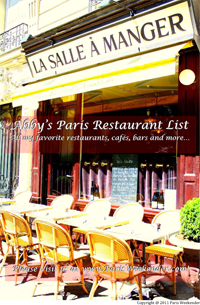 Updated Mini Guide to Paris and Restaurant & Bar Lists! 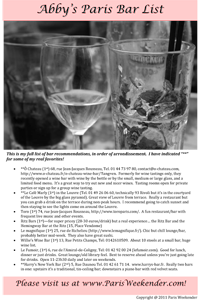 I have updated my Mini Guide to Paris, my Full List of Restaurant & Bar Recommendations, my Crème de la Crème Restaurant List and also my Bar Recommendations List. View them online or download a ready-to-print PDF! Cru (4th) 7, rue Charlemagne, Tel. 01 40 27 81 84. Featuring mostly (though not entirely) raw meats and fish, this restaurant is not for everyone. But if you’re intrigued, the food is quite good (I recommend the duck ravioli which is actually not raw) and the setting is quite inviting. **Le Béguin (9th), 2 Rue du Cardinal Mercier, Tel. 01 42 81 58 20. Le Béguin may be my new favorite restaurant in Paris. The burrata is amazing and only €8 for one person or €10.50 for a portion serving two people. All ingredients are farm-fresh. Excellent soups and salads, inviting 1950s diner-meets-bistro ecclectic decor, very friendly service. Open Mon – Fri 9:30am – 2:00am and Sat 10:00am – 2:00am, closed Sundays. Au Passage (11th) 1 bis passage Saint Sébastien, Tel. 01 43 55 07 52. This is a French bistro meets 1950s lounge, serving delicious small plates: try the bonite et aubergines fumées (raw tuna with smoked eggplant and a cream sauce), tomates à l’ancienne (fresh tomatoes with a white cheese), encornet à l’encre (whole squid in its ink)). Le Hide (17th) 10 rue Du General Larrezac, Tel. 01 45 74 15 81. One of the only good affordable French restaurants near Etoile, this bistro offers excellent gourmet 3-course menus for €29. Frederic Simonin Restaurant (17th) 25 rue Bayen, Tel : 01 45 74 74 74. It’s not a cheap place, but the €38 3-course plus amuses bouches gourmet lunch menu is exceptional if you are in the mood for a splurge. Le Relais de la Butte (18th), 12, rue Ravignan, Tel. 01 42 23 24 34. It’s hard to find a decent restaurant in Montmartre but this restaurant is just slightly off the main tourist route and the food is of good quality and service is friendly. Anahi (3rd) 49 Rue Volta, Tel. 01 48 87 88 24. The steak at this small Argentine restaurant is some of the best I’ve had in Paris and the space is intimate and inviting. The service is very friendly. Unfortunately it’s pricey (€60 or so per person) but worth a trip for a special ocassion. O’Scia (2nd) 44 Rue Tiquetonne, Tel. 01 75 77 23 18. Some of the best pizza in Paris in a cozy, old building in the Montorgueil pedestrian zone. I ordered the O’Scia Pizza (tomato, mozzarella and eggplant) and would go back and order the same thing again next time! Visconti (8th) 89 Boulevard de Courcelles, Tel. 01 43 80 78 22. Visconti does not look like anything special from the outside but it’s some of the best pizza and pasta in the Etoile/Ternes area and one of the few restaurants that don’t give you a hard time if you bring a stroller! Pizzeria Da Carmine (9th) 61, rue des Martyrs, Tel. 01 48 78 28 01. Despite its poor ratings on TripAdvisor, the pizza is some of the best in Paris. The ambience is nothing to write home about; they run a take-out business as well. Candaleria (3rd) 52 rue de Saintonge, Tel. 03 42 74 41 28. This hole-in-the-wall Mexican joint with a trendy New York-style bar hidden through the back door was a wonderful spot until unfortunately it was discovered by the trend-seekers. It’s still worth a visit for the cheap tacos or a more expensive cocktail on the early side or on a week night. Loulou Friendly Diner (5th) 90 Blvd Saint-Germain, Tel. 01 46 34 86 64. A new addition, probably the best American diner in Paris. It’s still not 100% American but I’d say a good 95%. There are a number of options for real American brunch fare and the diner is open 7 days/week. **Baan-Boran (1st) 43, rue de Montpensier, Tel. 01 40 15 90 45. Slightly more expensive than some of the other Thai options, it may be the best Thai restaurant in Paris. Rue Montpensier is also a great place to go to dinner, with wine bars such as Verjus and Willy’s Wine Bar nearby for after-dinner drinks. Wok (11th) 25 rue des Taillandiers, Tel. 01 55 28 88 77. A change of pace from your typical Parisian eatery, this Chinese restaurant allows you to make-your-own stir-fry–pick your veggies, protein and sauce and the chefs will cook it up right in front of you. Prices are quite reasonable (€20 or so per person). 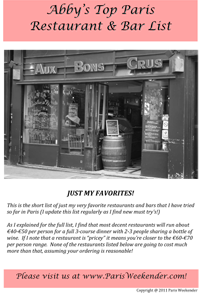 **Verjus (1st) 47 rue de Montpensier (wine bar) / 52 rue Richelieu (restaurant), Tel. 01 42 97 54 40. This new wine bar run by Laura and Braden of Hidden Kitchen welcomes you warmly into its adorable stone-vaulted setting. Order wine by the glass or bottle and if you are hungry, pick from small plates or wait just a couple of weeks for the restaurant upstairs to open. La Garde Robe (1st) 41 rue de l’Arbre Sec, Tel. 01 49 26 90 60. A small and cozy wine bar that also serves cheese and charcuterie to nibble on. **Ralph Lauren (6th) 173 Boulevard St Germain, Tel. 01 44 77 76 00. The setting for food or just drinks is unbeatable, both inside and out. Sit back and relax on the large terrace or try the wood-paneled bar inside. If you’re lucky, they will give you some homemade caramel popcorn with your drinks. The only caveat–you need to arrive during non-meal times if you are just looking for a tea or glass of wine.